DESCRIPTION: The sun acts as the catalyst for creating the lighter-toned leaf silhouettes on this gorgeous two-toned paper. The graceful leaf shape is from the Siris Ko pat tree in Nepal. 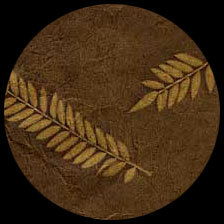 Somewhat curved like fern leaves, the shape is also very similar to the honey locust leaf found in the United States.